1. Problem-Solving. This is the first stage where a B2B buyer realizes a need for a new solution. We marketers hardly ever hear about this person unless we have consulting partners that cover our industry, or have massive ad budgets that make it impossible for buyers to miss us. The method for this stage is not a push strategy, but a consultative approach focused on detailed technological discussions with content experts. This stage is the biggest reason we need social media, partnerships, blogs, forums, associations, and networks. 2. Solution-Seeking. In this stage, the person has an idea what they need and is searching for a company to provide it. At this point the solutions can vary widely. 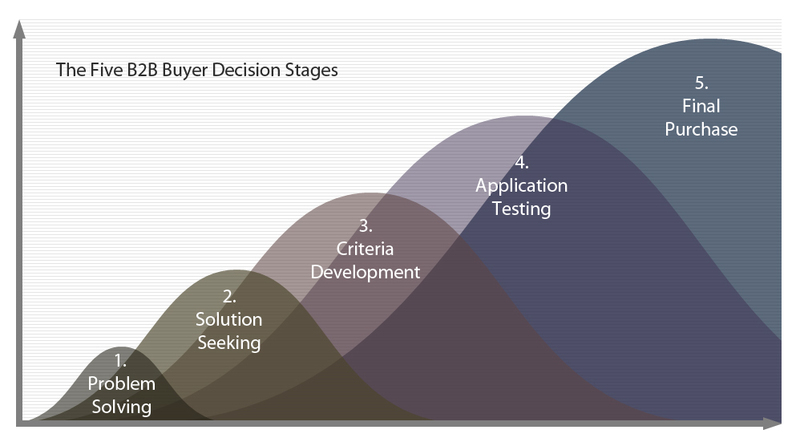 If a prospect finds you at this stage, your material should be crisp and oriented toward the value of your solution. Your company’s experience and capabilities play a large role in this stage. And that should be amplified through your expert webinars, white papers, and thought-leadership. It’s clear why your presence in the previous stage can build credibility for this one. 3. Criteria Development. Now your buyers have found which companies seem to offer a relevant solution, and are developing decision criteria. If this is your first contact with prospects, they are likely interested in your spec sheets, because they’ve compiled checklists and will toss your company in or out based on how well you match up. Your benefit statements are nice, but ultimately the question is: Do you deliver or not? It’s best if the criteria already match your product, because the customers found you in the first or second stage. 4. Application Testing. If this is when prospects find you, during a final sweep for companies that meet their criteria, this is when they’ll register for free trials, watch videos, grab brochures at trade shows, click on your paid search ad, and sign up to win the iPod you’re giving away. Your cost per lead might be lower at this stage, but there’s a reason; the close rate will be almost nil given that this person has not heard of you during the first three stages. 5. Final Purchase. This is the default value for how marketers and sales execs treat most prospects. We assume they are ready to buy, so we speak to them that way. We tell them how much money they will save or how much faster their systems will be, because we know we’re trying to influence a decision that is already made. This is where the big money is spent on publications, online banners and email lists, and this is where the traditional marketing metrics are well known: Impressions, Opens, Clicks, Eyeballs, Views, and Conversions. We all know how low these rates tend to be. For many reasons, the final purchase stage is almost always inappropriate for B2B marketers, but we do a ton of it. So how do you manage these five stages? First, I admit that the categories are simplistic. They are meant to easily identify what message, what material, and what method we should use for each stage. Secondly, I understand that not everybody has the same business needs. But in general, the earlier a prospect learns about you, the better. If your company is out there with consultative discussions, technical materials, benefit statements, crisp differentiation, and thought-leadership, you will be in the catbird seat, and someone else will be the afterthought. It may be irritating when you get a prospect who is a year from making a decision, but it’s powerful information to have. And it beats learning about that prospect a year later, when it’s too late. This entry was posted in Email Marketing, Marketing, Online Marketing, Social Media Marketing and tagged decision stage, decision stages, lifecycle marketing, marketing, marketing audience, marketing blog, marketing campaigns, marketing message, marketing strategy, marketing tactic, marketing timing by Tom Bishop. Bookmark the permalink.